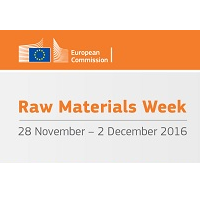 The 1st edition of "Raw Materials Week" will gather a wide range of stakeholders to debate and discuss raw materials policy and initiatives. It will take place in Brussels from Monday 28 November to Friday 2 December 2016. Further details about these events will be published shortly. Other stakeholders are invited to organise satellite events.